Most people assume that I grew up in Portland because I call it home and speak of it so fondly, but here's a fun fact: I actually went to high school in Houston, Texas. I had a very boring and typical suburban childhood experience: a trampoline in the backyard, movies every Friday, and hitching rides from friends to eat lunch off-campus at fast food places. The only really remarkable thing was the amount of crap that I was able to eat without too much consequence. My senior year (the year we upperclassmen were allowed to take lunch off campus), my friends and I would rotate through the slew of fast food options near our school: Burger King, McDonald's, Whataburger, Pizza Hut. Rinse and repeat. On Fridays, someone in my first period Spanish class would usually bring in Shipley's Donuts for breakfast. I ate it all, indiscriminately and with much enthusiasm, and only weighed about 110lbs soaking wet. Yep, those were the days. One day, my Spanish teacher (who, in retrospect, was tired of dealing with the consequences of us cracked out on sugar, shortening, and lard at 8AM on Friday morning), surprised us with a box of pastries from The Kolache Factory. Surprisingly, most of the class (including myself) had never heard of the Czech pastries before (despite the fact that, hey, kolaches were actually pretty ubiquitous in Houston). 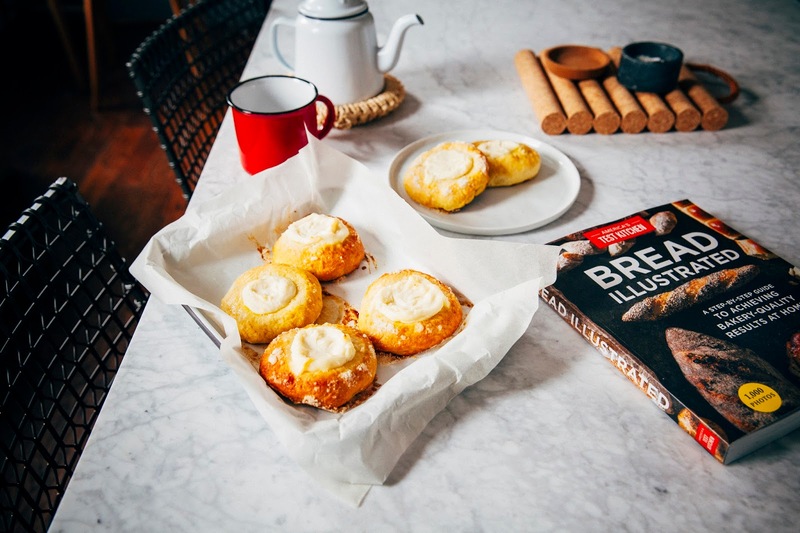 We peered cautiously into the box — some looked like ordinary dinner rolls; others mini danishes with a fruit topping but lacking in the traditional pastry glaze. A bite into one of the dinner rolls revealed a fluffy brioche bun stuffed with sausage and cheese, similar to a pig-in-a-blanket. 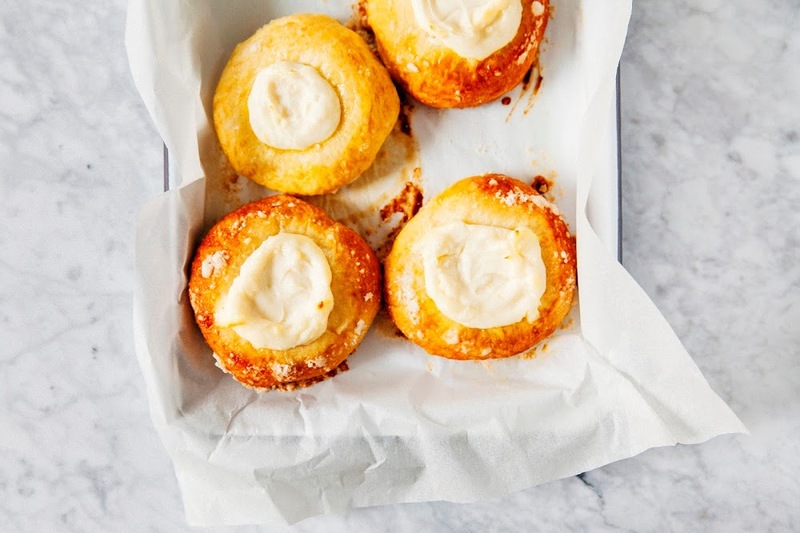 The sweet ones were like a cross between a jelly-filled donut and a cream cheese danish. And just like that, we were hooked and Donut Fridays became Kolache Fridays. 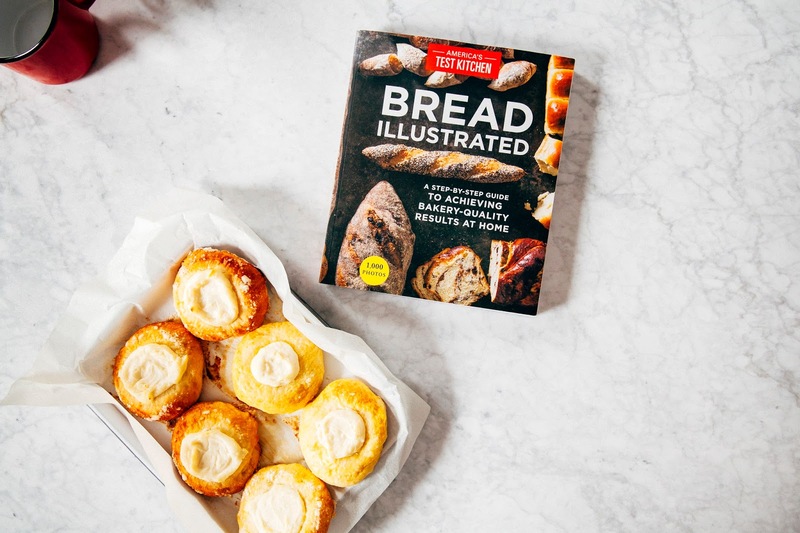 And until receiving a copy of America's Test Kitchen's new book, Bread Illustrated, it never occurred to me to try making them at home. I've never been much of a bread baker, you see. I've always found the entire thing to be laborious and intimidating. Braiding challah, twisting garlic knots, and shaping perfectly round buns — I've always found all of those to be such daunting challenges. But the carefully outlined instructions and incredibly detailed step-by-step photos in the book were able to convince me otherwise. And sure enough, after an afternoon of baking and with no loss of any blood, sweat, and tears, I found myself with a batch of kolaches that tasted exactly like the glorious ones I remembered from high school: fluffy and buttery, with a tangy and very faintly lemony cream cheese center. 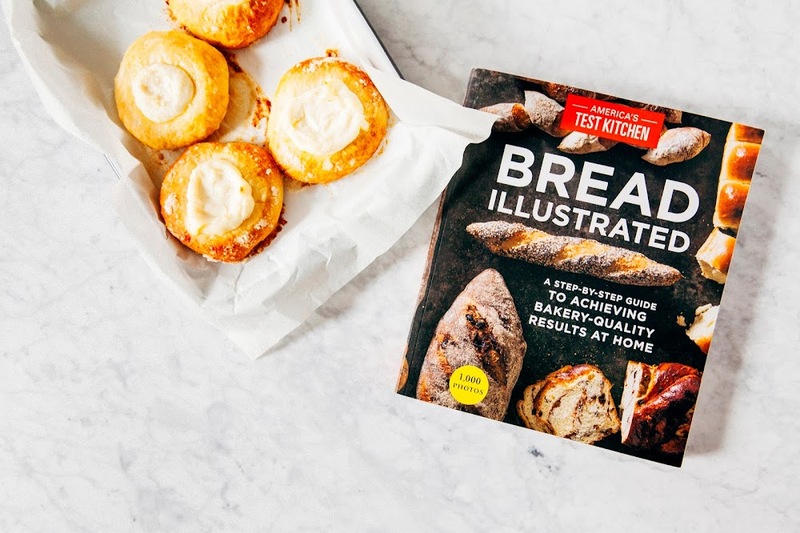 This post was done in partnership with America's Test Kitchen, who provided a copy of Bread Illustrated and some additional baking tools to make this post happen. 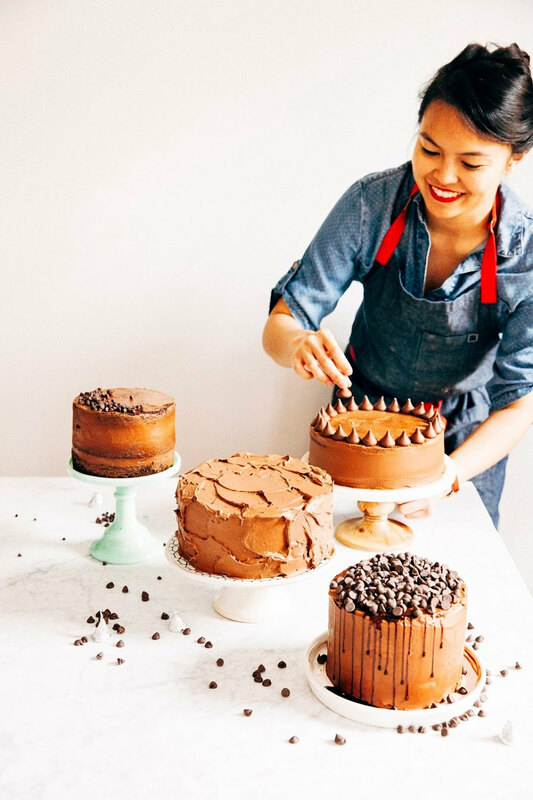 All thoughts and opinions are my own, and I genuinely believe that the folks at America's Test Kitchen are some of the most trustworthy cooking and baking experts out there. As always, thank you for supporting Hummingbird High and all my awesome sponsors! This is one of those recipes where it's important to pay attention to the ingredients and their temperature. The recipe uses instant yeast, which is distinctive from active dry yeast in that it doesn't need to be activated at a warm temperature. However, it does work best if all the other ingredients it's mixed with (like milk and eggs) is at room temperature. Not a fan of ricotta? Feel free to substitute it with an equal amount of cream cheese for an all cream cheese kolache. You can also create a fruit-filled variation by swapping the cream cheese with jam instead! 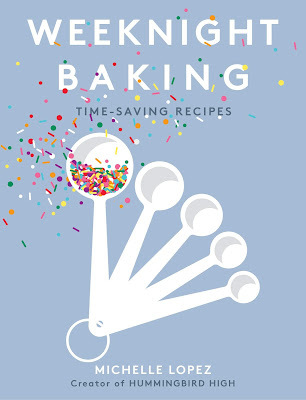 In the bowl of a freestanding electric mixer fitted with a dough hook, whisk together 3 1/2 cups all-purpose flour, 2 1/4 teaspoons instant or rapid-rise yeast, and 1 1/2 teaspoons kosher salt until combined. In the a small bowl, whisk together 1 cup whole milk, 10 tablespoons melted unsalted butter, 1/3 cup granulated sugar, 1 large egg, and 2 large yolks, whisking until the sugar is combined and the mixture is a pale yellow. With the dough hook on its lowest speed, slowly add the milk mixture (from the 2nd step) to the flour mixture (from the 1st step) and mix until a cohesive dough starts to form and no dry flour remains, scraping down the bowl as needed. Once there are no dry ingredients and you've got one solid dough mass, increase speed to medium-low and knead for about 10 minutes or until the dough is smooth, elastic, and clears the sides of the bowl (but still sticks to the bottom). Transfer the dough to a lightly floured counter and knead by hand to form a smooth, round ball, about 30 seconds. Place dough seam side down in a light greased large bowl, cover with plastic wrap, and let rise for about 1 1/2 to 2 hours or until increased in size by about half. While the dough is rising, make the filling. Using the clean, dry bowl of a freestanding electric mixer fitted with a paddle, mix together 6 ounces cream cheese, 3 tablespoons granulated sugar, 1 tablespoon all-purposes flour, and the grated zest from 1 medium lemon until smooth, about 1 minute. Add 3/4 cup ricotta and mix until just combined, about 30 seconds. Refrigerate until ready to use. Next, make the streusel. Combine 2 tablespoons plus 2 teaspoons all-purpose flour, 2 tablespoons plus 2 teaspoons granulated sugar, and 1 tablespoon unsalted butter pieces in a small bowl and rub between your fingers until the mixture resembles wet sand. Cover and refrigerate until ready to use. Once the dough has doubled in size, it's ready to be shaped. Line 2 rimmed baking sheets with parchment paper and set aside. Press down on the dough to deflate. Transfer the dough to a clean counter and stretch into an even, 16-inch log. Cut log into 16 equal pieces (about 2.25 ounces each) and cover loosely with greased plastic. Working with 1 piece of dough at a time (while keeping the remaining pieces covered), form the piece into a rough ball by stretching the dough around your thumbs and pinching the edges together so that the top is smooth. Place ball seam side down on the clean counter and, using your cupped hand, drag in small circles until the dough feels taut and round. Arrange dough balls seem side down on the prepared sheets, spaced about 1 1/2 inches apart. Cover loosely with greased plastic and let rise for 1 1/2 to 2 hours, or until increased in size by about half. Adjust oven racks to upper-middle and lower-middle positions and preheat the oven to 350 (F). Grease and flour the bottom of a round 1/3-cup dry measuring cup. Press the cup firmly into the center of each dough round until the cup touches the sheet pan to make an indentation for the filling. Re-flour the cup as needed to prevent sticking. Divide filling evenly among kolaches, scooping about 1 1/2 tablespoons of filling into each indentation. Smooth with the back of a spoon. In a small bowl, whisk together 1 large egg, 1 tablespoon water, and a pinch of kosher salt until combined. Use a pastry brush to gently brush the edges of each kolache with egg mixture, avoiding the filled centers, and sprinkle with streusel (do not sprinkle streusel over the filling). Bake in the preheated oven for 25 minutes or until golden brown, switching and rotating the sheets halfway through baking. Transfer kolaches to a wire rack and let cool for 20 minutes. Serve warm.